I have just learned how to insert source code into beamer with the listings package. 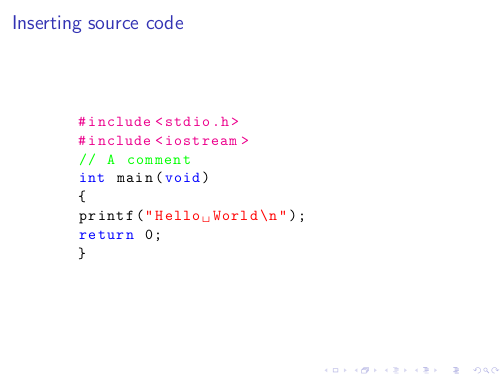 However I dont know how to go about adding any syntax coloring on the C++ source code. Here is the code I am currently using for source code insertion. Notice that there's no difference from Beamer or standard document in using listings. The package guide explains in detail how to do this, but you can also find information looking at the apposite tag listing on this site. The command \ttfamily sets the given style in typewriter. Not the answer you're looking for? Browse other questions tagged beamer listings color or ask your own question. How to include program listings in C# with custom font and syntax highlighting in LyX? Tikz in Beamer: Giving up on this path. Did you forget a semicolon? 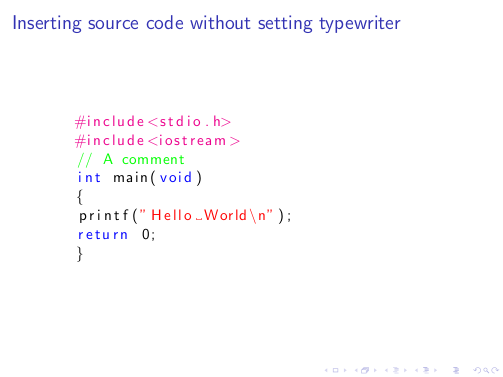 How can I add source code like the following image in the beamer frame? GNU Assembly syntax source listings?